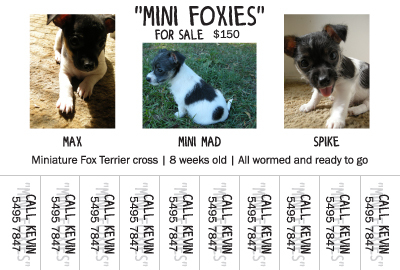 The other final touches were the names the family have been calling the puppies and the words mini foxies were included in with the phone number. (I have grabbed a phone number off a poster like this but when I got home I totally forgot why I grabbed the number). I also finished off the poster by trimming along the vertical lines between the phone numbers and also perforating the horizonal line making it super easy to tear away the phone number. So far (one week later) one puppy has been sold!